Concrete Driveway – Concrete Contractors, Concrete Construction, Concrete Paving | Bernardo Concrete Inc.
Shopping on the Internet can be daunting unless you start off from the right vantage point and that means having some criteria. That’s true for almost everything you can want or need online but when you’re dealing with a new concrete driveway, it becomes especially important to get the right people working for you. If you’ll be using concrete slabs, it’s essential everything gets done right the first time, so here’s a few things you need to look for. Experience should be at the top of everyone’s priority list. There’s no room to have an amateur company learn how to put in a concrete driveway and make mistakes at your expense. The trick is understanding which claims of experience are reputable since all the companies on the Web that want the job of putting in concrete slabs for you will claim to have experience. One of the best places to start gathering information is the About Us section on the website. This is where reputable companies that you want to deal with go in depth and even talk about the various clients they have worked for. Finding one of these client lists can be especially helpful since you can contact previous customers to find out what kind of job the concrete driveway company did for them. Before you start talking price with any firm you’re going to let handle concrete slabs for you, it stands to reason you’ll want to know how many times and how well they’ve done the job before. You should also look at the other services they offer and pay special attention to the ones beyond the concrete driveway job you want done. Remember that innovative companies have the flexibility to deal with various kinds of work that involve concrete slabs as well as other uses for concrete. It shows they’ve been around long enough to learn their trade. 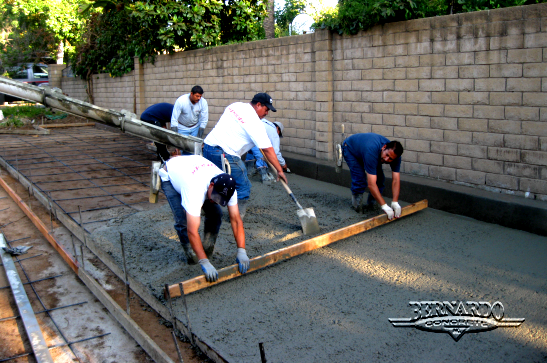 Over the past week B.C.I was hired by a homeowner in Sierra Madre to remodel their concrete driveway. Sierra Madre is a small city near Pasadena and is surrounded by the following cities; Glendora, West Covina, and Burbank. Bernardo Concrete has the ability to construct any concrete driveway to a customers request and for these homeowners it was simply to remodel their existing concrete driveway and to add a little personal touch. The production for this particular project did require more work than to simply remove and replace the old concrete driveway. However, Bernardo Concrete was able to complete the job efficiently while leaving these homeowners satisfied with the work they had done. The beginning for this concrete driveway project started out with removing the existing concrete driveway. After this was done and the concrete pieces were hauled away to a dump, we had to grade or push around the dirt in order to even out the area where the new concrete driveway was going to be installed. Grading the dirt also prepares the surface for the proper thickness of the concrete. For a concrete driveway the concrete is typically 4″ thick. Once the dirt was graded we were able to establish the elevation of the concrete. Before we poured the new concrete we poured a 10″ by 16″ curb between the existing wall and the new concrete driveway in order to help support the wall. Now that all the basic necessities were done before the concrete driveway was established we were able to pour the new concrete driveway. We started out by placing the rebar exactly 24″ on center to support the concrete and help prevent it from cracking. After this was done we poured the new concrete. We used a 2 by 4 to form the concrete and spread it out within the perimeter. The concrete finish for this concrete driveway project was mainly to level out the concrete using a screed. We also made sure we floated the concrete to seal all the rock pockets. After this we sealed the entire area of the concrete driveway using a tool to smooth it out. The last thing we did was broom the surface of the concrete for a more polished look and we also added rocks along the edges to give it a more personal touch for these homeowners. These homeowners were able to look at their new concrete driveway and see all the quality Bernardo Concrete had to offer them. Bernardo Concrete has been installing concrete for over 20 years now. That gives us the wisdom & experience of time and we like to think that it shows in our work. We specialize in industrial, commercial, retail and residential concrete services. We are always looking for a challenging concrete construction project to do, so let us know if you have one by calling Toll Free 888-499-0899. 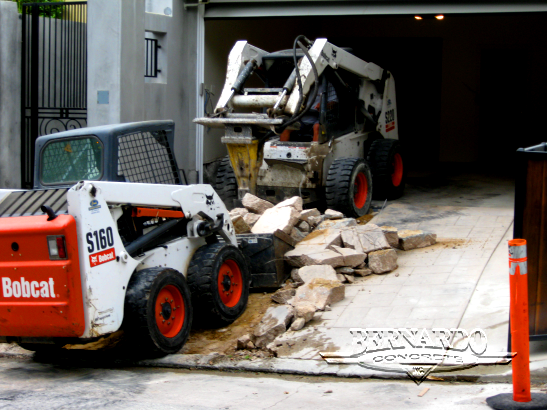 We offer many concrete services including concrete demolition, concrete driveway, curb & gutter installation and repair, handicap concrete ramp repair and installation (to ADA code), block wall installation and repair, concrete demolition, core drilling and saw cutting, and many more. There are just too many services to mention all of them so, take a look at our website by clicking on any of the links within this blog. We are located in Orange County California and service the surrounding areas including parts of Los Angeles, Riverside, and San Bernardino. If you have a project that requires a concrete contractor, then give Bernardo Concrete a call today and we will get an estimator out to your business for a fast, free and competitive quote. A concrete driveway does it all for a homeowner, because concrete is versatile, durable and easy to maintain. Your concrete driveway can become your own personal canvas to represent your home. Some of these ways may be by placing different types of concrete finishes such as stamped concrete, colored concrete, exposed concrete, and many other types of finishes. These decisions can be made by you the homeowner. Bernardo Concrete has many years of experience and understanding for these types of projects, which we consider custom designed for you. We at Bernardo Concrete understands that a homeowner always takes a lot of pride in the exterior of their residents, and a concrete driveway shows the quality Bernardo Concrete offers as you drive past. A concrete driveway has become a big part of the overall exterior plan for your home, and will leave a lasting impression for many years to come. 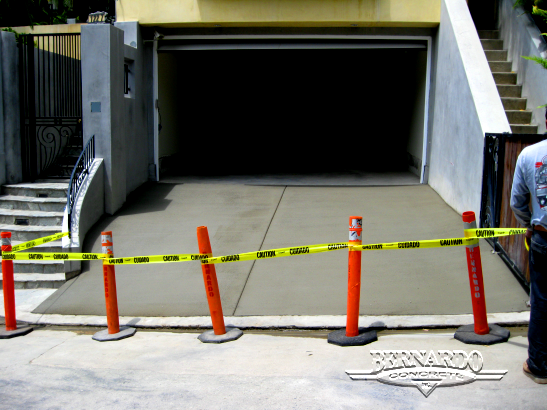 A concrete driveway is the simplest of things to miss as you park your vehicle on it or walk across it, but remember Bernardo Concrete never looks at a driveway this way. 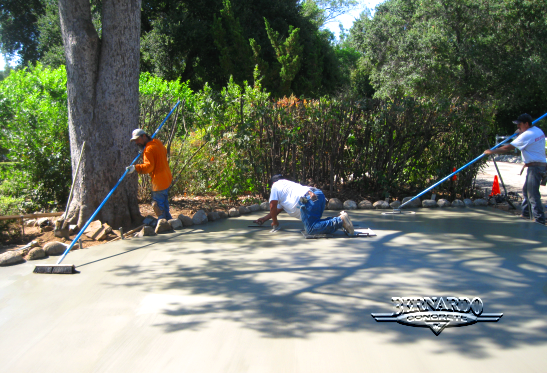 We consider your driveway the canvas to your home which creates a personal lasting impression.